BELOSELSKY-BELOZERSKY PALACE (41 Nevsky Prospect), an architectural monument of the Eclectic style. Reconstructed from an 18th century Neoclassical residence in 1799-1800 for Princess Beloselskaya-Belozerskaya (architect Demertsov). After the death of the owner's son, his widow married Prince Kochubey and reconstructed the palace again (1847-48, architect Andrey Stakenschneider, sculptor D.I. Jensen). The facades are decorated in the style of Elizabethan Baroque of the 18th century (prototype, Stroganovsky Palace). Porticoes of three-quarter columns and Corinthian order pilasters, segmental frontons with cartouches, Baroque architraves and atlantes' figures give the building splendour and magnificence. Richly decorated interiors (stairs, front enfilade, foyer, concert hall, church) present Baroque and Rococo styles. In 1884, Prince Beloselsky-Belozersky sold the palace to Grand Prince Sergey Alexandrovich. Following that, a number of architects were involved in the renovation of interiors. In 1905, Grand Princess Elizaveta Fedorovna, having becoming a nun, willed the palace to her nephew, Grand Prince Dmitry Pavlovich, who sold it in 1917. Soon afterwards, the building was nationalized. From 1920, it housed the District Committee of the Communist Party. During the Great Patriotic War of 1941-45, the palace was badly damaged. In 1949, it was reconstructed, and in 1954, its interiors were restored. As of 1991, the Municipal Cultural Centre has been located in the building. 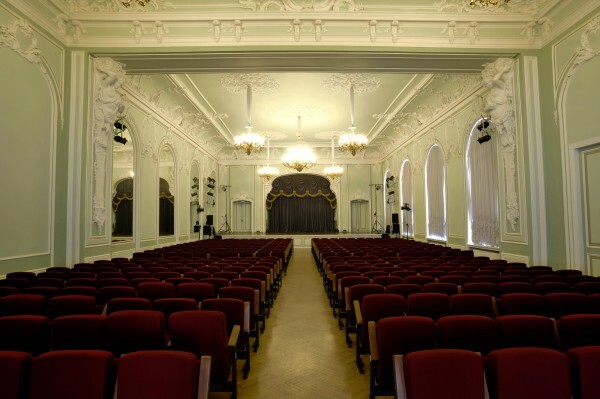 While the Alexeevsky Palace was restored in 2006-2010 the Petersburg Music House was situated in Beloselsky Palace, and the Mirror Hall became the traditional venue for the "Young Interpreters of Russia" concert cycle.